Driveways to people’s homes crossing cycleways are not a problem in The Netherlands, but the same goes for commercial driveways. I had already shown you the private driveways long ago, in this post I will show you how commercial driveways can also easily be combined with cycleways. A large commercial driveway crossing a bi-directional cycleway. There is virtually no difference between this and a side street crossing. Some posts take years before they really materialise. They start off as a vague idea but they need something extra to really become a full story. 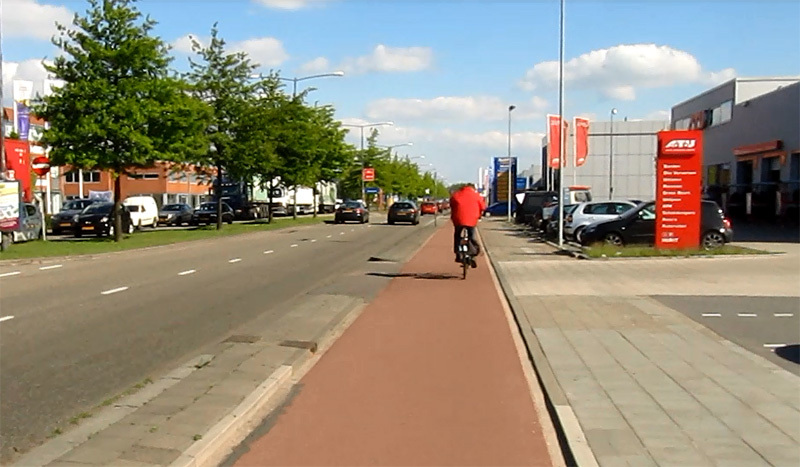 ʼs-Hertogenbosch has one street that always reminded me of streets I saw in the South-West of the US, the difference being that the Dutch version has separated cycle tracks. I long had the idea to show you this street, but I couldn’t really find the right approach. Then, almost one year ago, I was at the Winter Cycling Congress in Leeuwarden (an annual congress, this year’s edition will take place in Minneapolis/St. Paul next month). At the congress I met Marven Norman, a follower of my blog, who asked me about commercial driveways in relation to protected cycleways. It struck me right away: that was the angle I was looking for. At the time Marven was vice-president of the Inland Empire Biking Alliance in Redlands (CA) and he told me that he had several people asking him to explain how commercial driveways crossing a protected cycle way could work. He knew that I had already made a video about driveways to private residences, but people thought that commercial driveways – with more traffic – could still be a problem. I promised Marven I’d make a video, but I already warned him it would take a lot of time. I have posts lined up for months in advance and they are also held up by posts with current events. So indeed, it took almost a year, but I finally have a video to show you how it works! I already shot the footage for this video last Summer in that street in my hometown ʼs-Hertogenbosch called Rietveldenweg, that at places reminds me of US streets. This part of the street had only two lanes but the strip of grass on the left hand side was clearly kept free for a future extension to two more lanes. That never happened but this strip of grass was later used to build a bi-directional cycle track in 1996. There had never been any cycle provisions before that. 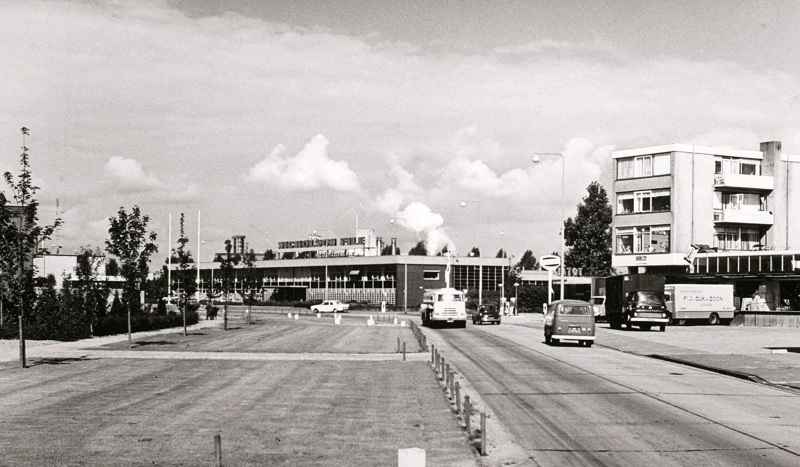 Picture from 1968 courtesy of Stadsarchief ʼs-Hertogenbosch. Rietveldenweg is a road as so many exist all over the world. For the most part it has two motor traffic lanes in each direction and there are many businesses at either side. The road leads from a motorway wide around the city to the city centre. Although this type of design is common in the rest of the world it has become increasingly exceptional in the Netherlands. That is because this type of street design does not follow the current ‘Sustainable Safety’ regulations. Newer through streets do not have so many end destinations, they would for instance have a separate service street to reduce the number of potential conflicts in the main road. This street, however, was built before that policy came into effect. It is a road in a commercial district with warehouses and production halls that was developed from 1930 to 1970. In line with the design traditions of that time it was built without any cycle provisions. The – for the most part – four lane road had some painted on-street lanes at either side for cycling, but that was about it. The main road had a railway track alongside of it, to get freight to the factories and especially the Heineken Brewery here. The train track was used very rarely in more recent years. 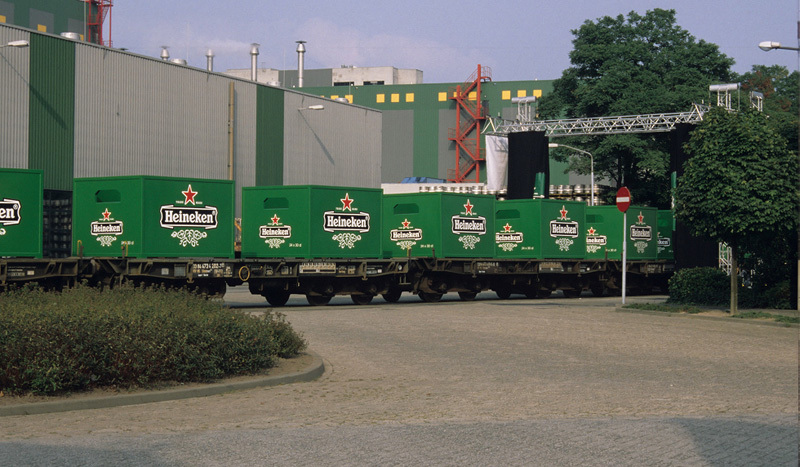 This special Heineken promotional train used it in 1999. Heineken had to use the track every few years or it would lose the rights to keep it. The city had long wanted to remove the railway track. Picture courtesy of RolandRail. An upgrade of this business district – 285 hectares of aging streets and buildings – started at the end of the 1980s and it was only in the 1990s that the so-called ‘sustainable revitalisation’ studies resulted in actual work on the streets and to the buildings. The first separate cycle tracks in this street were built around 1996, only 20 years ago. This Google Streetview image from 2009 shows the street still with the railway track. It was removed between 2010 and 2015 after Heineken had failed to use it in ten years. The bi-directional cycleway can be seen on the left hand side. The sight lines are very clear because it is not allowed to park cars. In the part of the street with 2×2 lanes for motor traffic a separate cycleway in each direction was built at either side of the street. In the part where there were only two lanes a bi-directional cycleway was built at one side of the road. In the mid-1990s bi-directional cycle tracks were not so common yet. That it was built here had several reasons. Firstly there was a strip of grass with space reserved for a road extension at one side of the street, that could easily be used. And secondly, on the other side of the street there was a freight railway line that led to the bigger factories from the main railway line. (Which only shows how old this commercial district was: built even before everything was transported in road trucks.) Thirdly, on that side of the street there are also no end-destinations. This is just one gigantic business location: the Heineken brewery (one of the Heineken breweries, the other is in Zoeterwoude). So people cycling do not need to be on that side. This man on his bicycle passes a commercial driveway. The continuous design of the one-direction cycleway makes it extra clear that people crossing the track in a motor vehicle must give way to people cycling. Sharks’ teeth or yield signs are not necessary because this is the default priority that derives directly from road law. The separated cycle tracks pass a huge number of business entrances, but that poses no problems with regard to who has priority. Under Dutch law turning traffic must always yield to traffic going straight on, on the same road. People cycling, and even people walking, are considered to be on the same road, even when they are on a separate cycleway, so if they go straight on they always have priority over turning motor traffic. What that motor traffic turns into is not important. Thus it makes no difference if motor traffic turns into a side street or a commercial driveway. Traffic coming from a driveway must always yield to traffic on the main road. Again that also includes people cycling and walking. Here there is a difference with standard streets. If there are two equal streets, traffic coming from the right has the right of way (unless there are signs regulating the priority in another way). In most through routes it is different. There the priority is given to the through route, not to the side streets. This can be done by putting up signs. That is also the case here. It results in the situation that people cycling on the cycle track have priority over every side street and every driveway. That goes for turning traffic and traffic exiting driveways or traffic that wants to enter the main through street from a side street. This is a very clear situation and that’s why it works so well. Of course there are always drivers who don’t look well enough or who are distracted. Especially for the bi-directional cycleways there are extra signs telling drivers that people cycling can arrive from two sides. At some points where there is a reduced visibility the city even put up mirrors. So how safe it this? 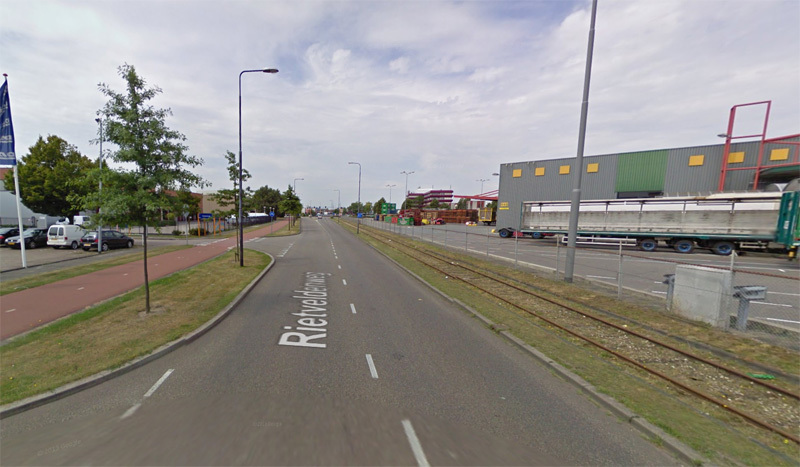 I have no access to extensive recent figures about crashes for this street, but the crude ‘accident’ reporting site Ongelukken op de kaart does not report any incident of drivers of motor vehicles crashing into people cycling at these driveways for the period 2007-2014. So it is safe to say that cycle tracks combined with commercial driveways work very well. Thanks for this post on cycle track priority at large driveways. At 1:21 in the video there is an intersection where the cycle track seems to stop before the intersection and then start again after the intersection. This seems strange, as this would be the place where a continuing cycle track is most important. Can you explain why the red cycle track stops there? 1:21 missing cycle track seems like a glitch. An old or new peace of road where the red track has been forgotten. As bicycles still have priority from the right (indicated by the triangles), and as the cycling ‘track’ is a continous road, it should have priority over the left as well, but this is now less clear because of the missing red, so I believe it actually should have continued here as well. Regarding your Brisbane crossing design. It looks clean and modern and very well done overall. I am just a bit worried about the zebra crossing. Turning cars now have to look at both sides first for cyclists and then for pedestrians. I am not sure if the human mind is very well at handling so much information in the short amount of time crossing, so it might create a false sense of safety for pedestrians. Also: as there is only room for one car waiting, it might clog the main road more often if cars have to wait longer for crossing pedestrians or by looking longer. One could consider replacing the zebra by non priority walking lines (pedestrians have a lot more time to take in the situation before crossing). Is the area being crossed into a housing quarter? I’m trying to envision how much it would cost per mile to transform a typical arterial street in a city in the U.S.A into what is shown in the video and pictures above. I’ll use the city of Los Angeles as an example since that is where I live. There is a 6.6 mile extension of the Expo light-rail Line that has been completed and is in the testing stages now on the west side of Los Angeles and the city of Santa Monica. This rail line travels east/west and will connect the beach city of Santa Monica to downtown Los Angeles. Part of this Expo Line extension was to get a bike path running next to it in a trench which would avoid inclines in an area called Cheviot Hills. That part of the path would be about 0.7 of a mile and the cost estimate for construction is $52 million, or $74.28 million per mile. Which the city of LA does not currently have the money for. There were two additional options proposed. Option 2 is to build a grade separated bike path on the residential street that parallels, and is a few feet away from, the Expo Line trench. That would cost $36 million. If its also 0.7 of a mile, then that’s $51.42 million a mile to construct. The city of Los Angeles has 3,000 miles of arterial/collector streets and 719 miles of those streets are on the bike plan. If it cost at least $51 million a mile to create a grade separated cycletrack on a arterial street, then that would be $36.6 billion to complete the 719 miles of bikeways as grade separated cycletracks. Spreading that amount out over 40 years would average at least $1 billion a year if cost increases over time are included. A less costly project per mile in LA is the upcoming MyFigueroa project that is 4.5 miles long and will cost $20 million. Part of this length includes parking protected bike lanes which won’t be grade separated that will also run between bus stops and a curb. This money will also go towards pedestrian level lighting and sidewalk improvements. Its beyond my comprehension how any large city in the U.S. could create a network of grade separated cycletracks in the next 40 years like there is in cities in the Netherlands when considering the difficulty in obtaining the space and money required to build it. A lot of U.S. cities, including Los Angeles, aren’t spending enough money to properly maintain their streets. Adding in an additional cost of millions of dollars per mile to build a complete network of grade separated cycletracks would be beyond reach. That’s why the default way of building cycletracks in the U.S. is to use the existing street as the surface and then use temporary or permanent barriers for separation. That being said, the first parking protected bike lane on Reseda Blvd in Los Angeles is probably fairly typical for how U.S. cities create cycletracks using temporary materials such as plastic bollards, striping and perhaps green paint or thermoplastic. A huge downside to the Reseda Blvd cycletrack is that it is not an attractive looking addition to the street due to the use of temporary plastic materials. If there are no bollards or green lane markings it will likely end up with motorists invading the space like the buffered bike lanes recently installed on Vineland Ave in LA. The motorists are lined up in three of the photos to wait their turn to get onto the freeway, which is the overpass just ahead of them. 1 mile of urban freeway can cost $50 million so I find it impossible that 1 mile of grade separated cycle track would cost that much. Why did at 3:48 PM (Mountain time, about 11:48 PM Dutch time) on Sunday Jan 17, I get an email suggesting that you have written a post about the Kapteynlaan, but when I click on it, it says that it’s somewhat embarrassing that the post cannot be found on your blog? That was a mistake. I clicked the wrong button. Sorry to everyone who got that same e-mail. The new post will be there in about 22 hours, at the normal posting time. 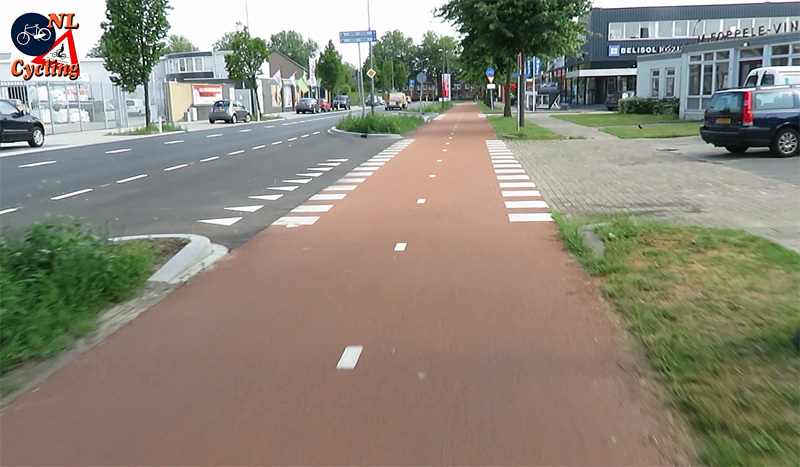 Salute to the Dutchies and your bike paths.This country is very cyclist friendly. As a newcomer I am filled with so much wonder of the cycling paths. I bike not only to school but also when I do groceries or shop and when I want to go places around the city. Where I come from, this is next to impossible for most people because then you’d be sharing the highway with all manner of vehicles: cars, motorcycles, scooters, and even 10 wheeler trucks. I have to always be watchful and prepared to take evasive maneuvers. Fortunately bicycles are very quick and agile. I understand that in Europe talking on the cellphone while driving is illegal. And some in countries, cars don’t have cup holders. The message being that when in the car, people should focus on driving and not something else. People here would fight against such restrictions. Actually, the other Heineken brewery is in Zoeterwoude (near Leiden), not Zoetermeer. Of course it is, my mistake! I have changed it. Thanks! I notice this street doesn’t have trees in the grass between the cycletrack and the roadway. Is this a design standard or just that’s just how it works here? Here in Alexandria, VA our residents want cycle infrastructure and tree-lined roads. Unfortunately, these have combined to produce obstructed views big enough to hide all but the largest SUVs and trucks. Like some trees then? How about….https://goo.gl/hbrNQQ Nijverheidsweg Noord, Amersfoort. Or https://goo.gl/RQLGkC Zuiderinslag, Leusden. Etc, etc. Thanks, and visibility is not impaired for cyclists, drivers, or pedestrians. We rode a similar street in Den Haag (Binckhorstlaan) the day we picked up our bikes and rode them to Delft. It was eye-opening, with how similar yet how different the infrastructure was. We have many roads here in the American west that look like this for cars, but none could our then-six-year-old have ridden on her own bike. I also realized that this is the street that connects to the fietsstraat through a residential neighbourhood, on the south end of the street, intersecting with the Buysballotweg (how did that street get it’s name? Are voting stations usually located there?). Maybe worth a mention? But yes that is right it is connected to the Fietsstraat there. I wonder how often Dutch words about cycling, fietstraatsen for example (I’m hoping I am using the correct plural), or fietssnelwegen, have entered English conversations about cycling, aside from the times you speak or write in English, like in your reply (I hope I didn’t jinx myself, which if you didn’t know, jinx means have something happen exactly the opposite way as you predicted very soon after you predicted) to this comment. I also wonder whether anyone you filmed recognized you and said Hello, or the equivalent in Dutch. If you work at the Heineken building, how could you cycle to work? Thinking of Heineken, how often do Dutch people (obviously not small children, big children, sometimes, especially when the age was 16) drink and bike, or get high on cannabis and ride? The Dutch are well known for the latter kind of impairment. I think it is quite usual, because cyclists are not routinely checked for alcohol while drivers are. Drinking and riding a bicycle is considered normal behavior. You don’t drink and drive a car (that used to be illegal but socially accepted in the 70s, was frowned upon in the 80s, and is currently an absolute no-go) but it’s perfectly normal to ride a bike home from the pub. It’s technically illegal, but not enforced unless you’re very drunk and/or causing obvious danger. They once did some research in a large student city on a friday night, and found over 50% of the cyclists having alcohol levels over the legal limit. Cannabis usage in the Netherlands is very low. It’s readily available, but usage is much lower than in the USA or Canada, for instance. Most people use it a few times when they’re young, and then give up on it. But i assume that cycling while being high is comparable to being drunk. Can you make a video showing how rural 60 and 80 km/h roads work, not on the main routes, just the ordinary country lanes where you sometimes mix with traffic and sometimes don’t? Also worth saying is how the Dutch clear cycle paths when it is too cold for the anti salt system to work. Just brushing it? My city could certainly use a lesson in that. In general in the Netherlands we simply use salt as well when it snows or is icy. And only on main though roads. A small layer of snow is still fine riding on carefully. Ice is trickier. Still possible if your carefull, but not advisable if your old cause a fall more often has serious effects. Lots of people fall when it is icy here, in that sense the Dutch are not much different then bikers elsewhere (ofcourse we do ride slow). 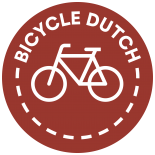 This entry was posted on 12 January 2016 by Bicycle Dutch in Original posts and tagged ’s-Hertogenbosch (Den Bosch), driveways.